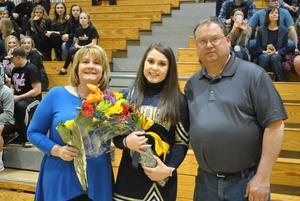 Knoch Boys' Basketball and Cheer Teams celebrated their seniors last week at center court. Recognized for basketball were Seniors Austin Neel and Julian Sanks. In addition to the Senior recognition, Julian was also awarded the Karen Shoop Award. 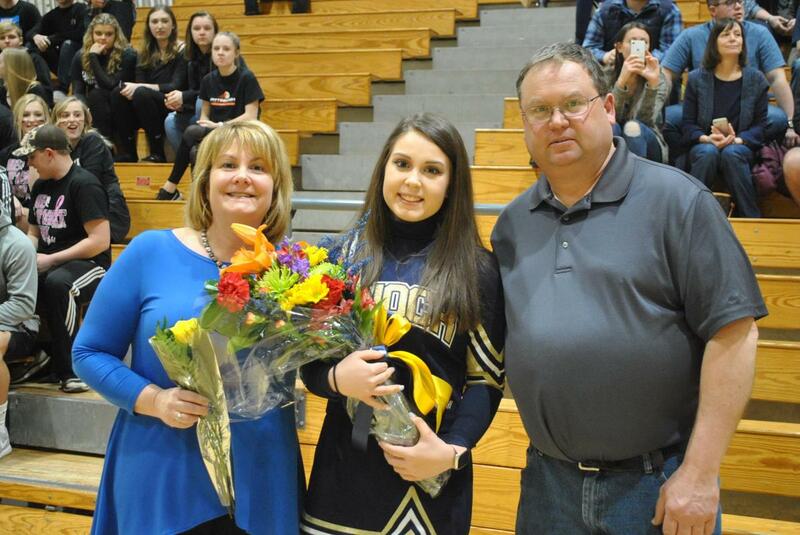 The Cheer Team also recognized 12 seniors. Pictured below, they are (front) Carly Wehner, Alyson Stull, Camryn Lilley, Morgan Tupper, Celeste Beacom, Kylie Feldbauer, Skylar Clark, and Veda Reiser; (back) Madison Nicolazzo, Mikayla Moretti, Autumn Trempus, and Kaylee Rodgers. Congratulations to all these Seniors and good luck in your future pursuits!